As described on the site. COMMUTER BACKPACK (waterproof) – Messenger bags are great, but with two straps to distribute the load, a backpack is often a more comfortable option for longer rides or heavier loads. Unfortunately your options have either been student backpacks that leak like a sieve, sit up too high, or cost a fortune. 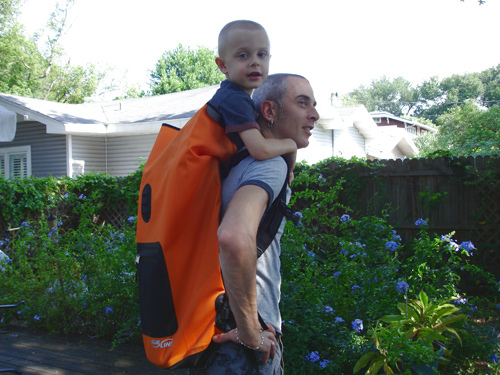 We designed our backpack with a full welded waterproof liner that is removable and replaceable if it is punctured. * Waterproof 2-layer design: outer ballistic nylon layer wears like iron; replaceable waterproof liner keeps contents dry in a downpour (will not keep water out if submerged, in case underwater-riding is your hobby). The Banjo Brothers Commuter Back Pack is a pretty strong and reliable bag. I’ve been using this baby for a many months and it hasn’t failed me yet. The bag has a few highlights that I really like such as the side pocket in which is big enough to carry a u-lock. Though they said it was more designed for a small u-lock, my normal sized piece fit just fine. I also like the zippered storage and of course the little blinkie hanger on the lower section of the bag. The back pack is a bit more comfy than a traditional student bag. The padded shoulders and padded back helped ease the strain of carrying a bag full clothes and gear to work. Ok now here’s my MOST favorite part of the bag….the reflective “racing stripes�? on the back. I mean talk about killing two birds with one stone! Not only did they make this back pack more safe, but its even cool looking with the reflective stripes. Don’t worry, those stripes do work at night. They’re kinda like the reflective arm/ankle bands you can get at the bike shop. I talked about how comfy this thing is right, well when you have way too much things to bring with you, the back pack doesn’t disappoint. Just check out the things I had to carry on a recent liquor run. All that was pretty darn heavy, almost felt like I was carrying a ruck sack for an army of drinkers…Banjo says that the back has something like 1500 cubic inches of storage….1500 sounds allot! It’s actually way more than I really had to use. Even after our little trip to the liquor store, the bag still felt fine. I didn’t feel it cutting into my massive body builder like shoulders, not did it tear or rip at the seams. In fact, the bag is so well made that not even a thread came undone in the months that I’ve had this. Now that’s quality if you ask me. I’ve had other bags…one even a hand made customized hydration pack that started fraying on me after a few months of use. But the Banjo factory seems to know what they are doing. The bag has a white water proof liner that protects all your goods from getting wet. I like how it’s white, makes it easier to find things that are in the bottom of the bag. You can actually remove the lining from the bag. But I never did, I like the fact that it was there constantly protecting my skivvies and work clothes due to wetness from my sweaty back. One of the claims that Banjo Brothers says this bag is capable of or has the ability to be is…�?WATER PROOF�?. Since it hardly rains in sunny Southern California, and it is September right now, I enlisted the help of my kids to see how “WATER PROOF�? this bag really is. So if you check out the video you’ll see that the bag pass our test. Now I’d imagine if you’re someplace that rains allot, this might be a significant factor in your choice of buying a bag. Now I’m not so sure if our water test will impress you folks up in Seattle or Portland, but as you will see, it did really well. Bottom line, I really dig this bag. For the folks that don’t like to ride with a messenger bag or panniers, I’d tell them to get a Banjo Brothers Commuter Back Pack. It’s a great deal, waaaay cheaper than any other messenger bag out there, more comfortable…and I know what I’m about to say next will get some smack, but it LOOKS WAAAAAY COOLER THAN A PANNIER COULD BE. So if you’ve got a strong back and Ginormous shoulders like I do, and you think you can huck around your stuff in a back pack, then get this bag. Like I said, its cool, not just cool, its UBER cool! 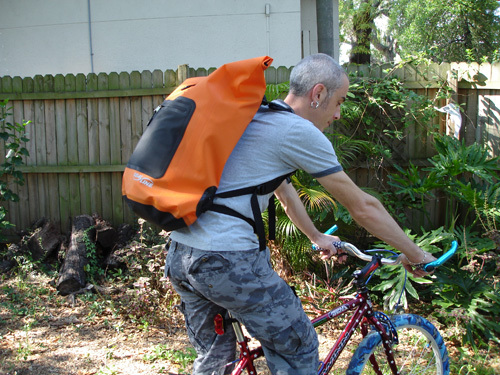 Seal Line, the makers of dry bags and packs for watersports enthusiasts, have created an “Urban” line of waterproof bags (backpacks and cross-strap shoulder bags) aimed at bicycle commuters, messengers or anyone else needing a rugged way to carry items on a bike. The bag’s shoulder straps and back panel are made of a dense, perforated foam covered in rubberized mesh. Both of these features increase ventilation. In addition to the shoulder straps, there are both waist and sternum straps made of nylon webbing with quick-release buckles. The waist straps tuck away into hidden compartments when not needed. Finally, there is a built-in web carrying handle at the top of the harness. I loaded up this bag with a pair of dress shoes, library books, a couple of large towels and a few other assorted items and took the bag for a couple 8-10 mile rides. I estimated the load weight somewhere around 20 lbs. Overall, the bag was surprisingly comfortable — the harness padding works fine and an internal stiff plastic sheet against the back wall prevents sharp corners from digging into the wearer’s back. The harness system keeps the bag from swaying or shifting as I rode, even under high RPMs. I can’t say that about my current messenger bag, which moves all over the place even with tight cross-straps! 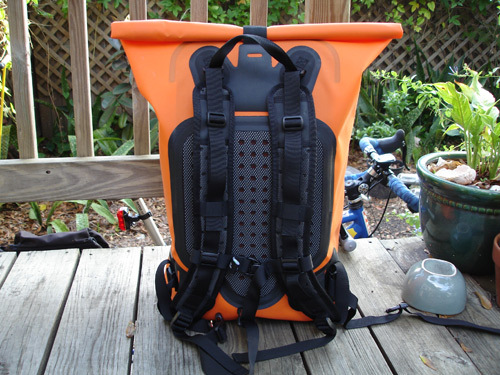 Despite the perforated back padding, you WILL get a sweaty back from riding with this bag — it covers so much of a rider’s back that “SBS” (Sweaty Back Syndrome) is unavoidable. Thank the stars this bag is waterproof, right? And just how waterproof is this bag? Seal Line rates it as “watertight” — able to withstand quick submersions and able to float if dropped in the water. The bag’s seal is really quite simple. It consists of a stiff plastic lip on one edge of the opening and an elasticized “Quick Clip” closure that holds the bag shut. A rider simply fills the bag, presses out any excess air, rolls the bag’s top two or three times and engages the quick clip to seal it. It is a quick, ingenious and foolproof method of closure, and it will SEAL this bag!!! I filled the backpack with newspapers and proceeded to direct a high-pressure jet of water directly at the rolled seal and other parts of the bag. The bag shrugged off this onslaught, and when I opened it to check the inside, everything was bone-dry. VERY impressive! Durability over the long haul shouldn’t be a concern. The bag’s material is tough stuff, and the seams are all radio welded over a wide margin. The materials and construction of this bag are top notch: tight, even stitching on the harness system; no odd puckers or sloppy areas anywhere on the bag. Really, the only negative mark I can give this bag is that it is too big for my personal commuting needs –I just don’t carry enough stuff to justify such a large bag. 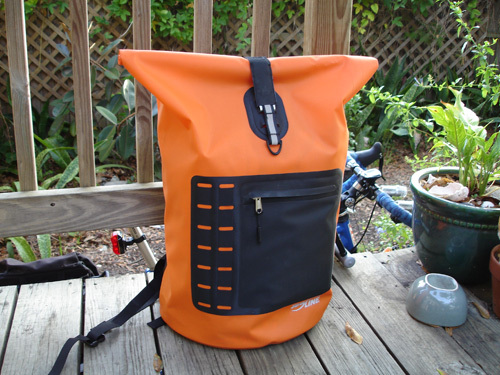 This bag is probably better suited for high-mileage commuters and bicycle couriers who need a high-capacity bag — folks who have to carry a lot of stuff and be sure that it arrives safe, clean and dry. Oh, did I mention this bag is B-I-G? 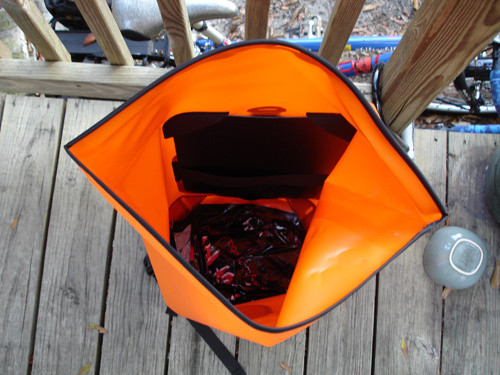 Check out Seal Line’s complete lineup…I am sure there’s a bag solution for almost every rider!